N5 is the designation for the National Highway of Pakistan. It is the longest highway of Pakistan and has a total length of 1756 kilometers. It starts from Karachi and ends at Torkham. While many people know about the major cities that lie along N5, there is a colorful array of smaller towns and villages which are also worth mentioning. 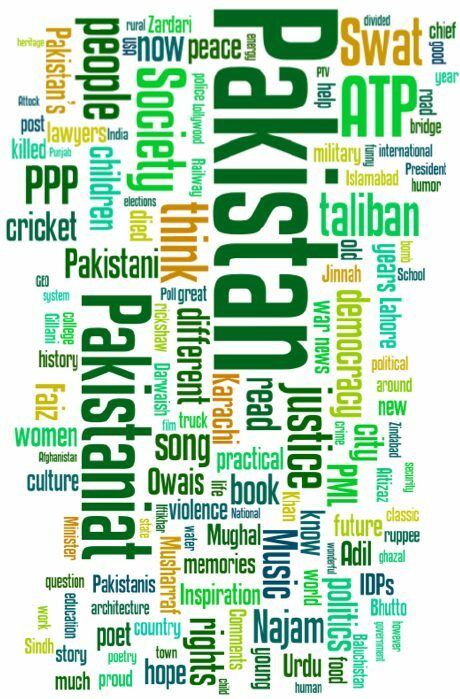 In this article I will limit the discussion to the smaller towns of Pakistan which do not get covered in Mainstream media. Lets start our journey on N5 which will be 5 episodes long. Our first stop today will be Bhit Shah. We have a dedicated post on Chaukundi tombs. Please read here. Traveling north from Hyderabad on N5, one has to drive 45 kilometers on the highway and then three kilometers east on a side road to reach the town of Bhit Shah. Bhit Shah is famous for the tomb of Shah Abdul Latif Bhitai (1689-1752) who is considered by far the greatest poet of Sindhi language. The shrine is situated on a ‘bhit’ (mound) and hence the name of the place Bhit Shah, the Mound of the King. Millions of devotees come to his tomb every year. The tomb was raised by the first of the Kalhoras and subsequently beautified by the Talpur Mirs. The tomb and an adjacent mosque are famous for the tile and mirror work done on them. It is interesting that none of the tiles used in the Bhit Shah complex come from the nearby tile making center of Hala. The tiles used here either come from Naserpur or Multan. Whatever little life left, is to see the beloved. Bhit Shah is the only shrine anywhere in Pakistan that has a post-sunset performance of Sufi music and singing everyday of the year. The main instrument played here is the drone-flute damboro, said to have been invented by Shah Abdul Latif himself. Five kilometers north of Bhit Shah on N5, is a city called Hala. Hala is famous for the mausoleum of Mir Makhdum Nuh who died in 1592, though the present tomb dates back to 1790s. A severe flood in Indus in 1790s destroyed most of Hala. The city was then rebuilt by one of the Mirs at its present location. The present city of Hala is divided into two smaller cities. New Hala is located by the highway, where as old Hala is located couple of kilometers to the west. One enters old Hala through an arched door. It is most famous for its handicrafts industry. Hala is also noted for its blue and white ceramics and exquisite lacquer work. It is a nice place to stop and do some shopping of traditional Sindhi handicrafts. The general impression that one gets here is of being impressed but pained. Local artists are plenty but very poor. Hala is also famous for its role in Pakistan’s politics. The Makhdum family of Hala has been in and out of power corridors of Pakistan a few times and instils a strong hold on to local and national politics. The countryside near Sakrand is desert like with full fledge sand dunes right next to highway and an abandoned rail track that also ran parallel to N5. This railway track was laid here to bring labor during the construction of Sukkur Barrage on river Indus some 230 km north. Overtime it lost its commercial value and got closed down in mid 1980s. The city of Sakrand was a Railway junction and a track from here connected to the main line at Nawab Shah, which is located less than 20 km to the east. A road also connects Sakrand with Nawab Shah. On this road three ancient mounds called “Chanhu Daro” have been discovered. Painted pottery, copper and bronze medals, children toys, bead making equipment and seals have been discovered from the area. The presence of a drainage system similar to the one found in Moenjo Daro puts this area in same significance as other towns from Indus valley Civilization era. Following is a photo of KM 259 on N5, showing distance to Moro as 61 km and Kazi Ahmed 16 km. Next town towards north is ‘Kazi Ahmed’ which is located 30 km from Sakrand. ‘Kazi Ahmed’ used to have a rest house belonging to the department of irrigation located right next to the N5. I have fond memories from yesteryears of stopping at this rest house for a cup of tea and to freshen up. This rest house used to serve employees working on the maintenance of 500 km long ‘Rohri canal’ as well as the maintenance of protective dams of River Indus. Rohri canal by the way, is wider, deeper and longer than Suez and Panama canals and remains an engineering feat in this part of the world. Kazi Ahmed also had a railway station and was fed by trains from Tando Adam and Nawab Shah. 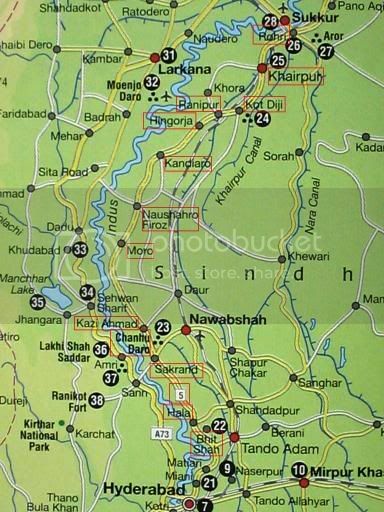 20 km north of Kazi Ahmed is the town of ‘Daulatpur Safan’. Rail and road used to run parallel and within few hundred feet in this section too. Until 1980s Daulatpur was famous for its red brick houses. There was not a single house in the town that was not made of red bricks or was not painted in brick red color. From a distance the city’s skyline used to look like a brick wall of red color. All that changed in mid 80s and I started noticing multi-colored houses appearing in red skyline. 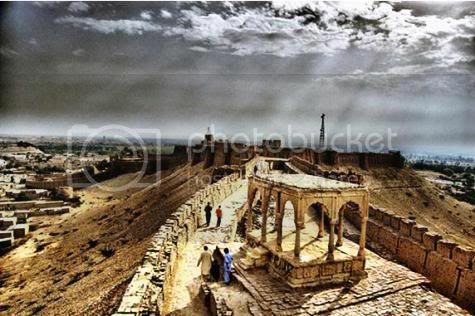 Daulatpur of today is indistinguishable from any other town of Sindh. ‘Daulatpur’ was also among the forefront of famous (or infamous) ‘Movement for Restoration of Democracy (MRD)’ of 1983 and one day the city’s railway station got burned down by an angry mob. The railway sleepers and signals were also uprooted repeatedly in this area. After that the Railways closed down this section for good. 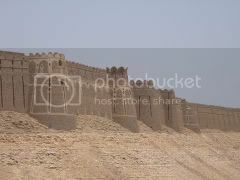 A few kilometers North East of Ranipur, N5 passes next to the historic fort of Kot Diji. This fort was built in 18th century by Mir Sohrab Khan Talpur and was used by him as residence. Just across the fort of Kot Diji, on the other side of N5 archaeological sites have been found. The civilization here seems to be older than that of Moenjo Daro and appears to have ended in a huge fire. Other than some stone foundations there is not much to see. Further north of Kot Diji is the city of Khairpur. Khairpur was a princely state founded in 1783 by a branch of Talpurs ruling Sindh. It is still the residence of erstwhile ruling family of the Talpurs and has two impressive mansions belonging to them. One of them is called Faiz Mahal. While they are private residences, permission to visit them can be secured onsite. Khairpur’s status of a princely state ceased in 1955 when all princely states falling under Pakistan’s geography became part one-unit province called the West Pakistan. Today Khairpur is famous for the production of dates. It is also home to Shah Abdul Latif University‘s campus which was founded in 1987. 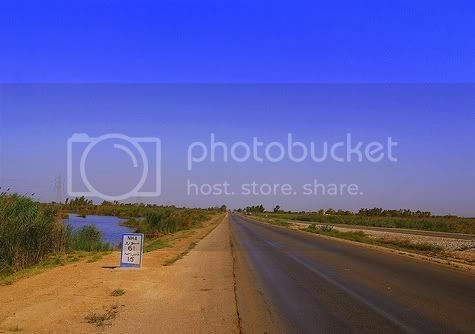 Approximately 15 km north of Khairpur is the town of Rohri. It is located on the east bank of river Indus and it has its own collection of goodly buildings. While the city is changing fast, one can still find many buildings at least 2 centuries old among the narrow lanes. Rohri’s ?Jamia Masjid” was constructed in 1564 by Fateh Khan who was a courtier of Emperor Akbar. There is another mosque called the ?Idgah masjid” which also dates back to 1593. Rohri has many artificial forests around it. These were planted by the Talpur rulers as well as the British to provide cheap wood for fueling the steam locomotives. Rohri remains one of the most important railway junctions on Pakistan’s rail network. The mainline branches off to Sukkur, Quetta and Chaman from here. This ends our current episode of towns along N5. From Rohri N5 goes north and after passing through Pano Akil (N5 km marker 515), Ghotki (543km), Sarhad (554km), Mirpur Mathelo (568km), Daharki (582 km), and Ubaro (596 km) it enters the province of Punjab near Kot Sabzal (N5 km marker 612). The total length of N5 that falls in Sindh province is 612 kilometers. A map of N5 as it passes between Hyderabad and Rohri is below. The cities and towns that were discussed in the article above are marked in red rectangular boxes. (1) The black and white photo of Shah Abdul Latif Bhitai is shared from here. (2) Photo of Shah Abdul Latif Bhitai’s tomb is shared from here. New information added for kilometer marker 26 today. It is for Chaukundi tombs. so i hope you will do. Picture of the Day: Whose Cars are Rotting in Pakistan?